Picture yourself on Guam, cruising North-bound on Tumon Rd. heading towards Gun Beach. You pass the gate and find yourself looking at an enormous “shack” nested into a few coconut trees with a perfect view of the sunset. Looking in-land, you’ll find a hidden path that will take you to a traditional attraction called Gokna. In this traditionally inspired village, you can take a step back in time and witness how “life” was interpreted during the Ancient Chamorro times. You can see the coconut leaf thatched hutts, concrete latte stones, a fire pit, and a Taro patch. These were all essential items to have in a village to survive. 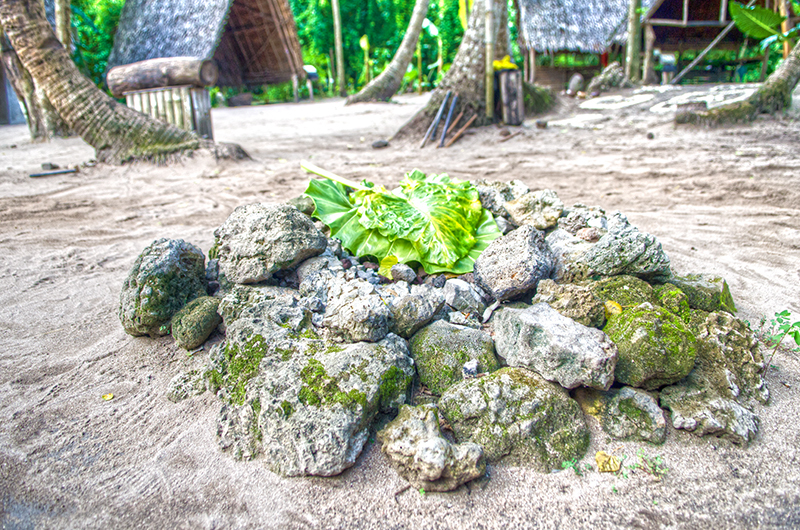 The latte stones served as the foundation of the chamorro house, providing them shelter. The taro patch was a very important source of food because it served as their “carbohydrate” to perform daily functions through out the day. Typically, an Ancient Chamorro could be a hunter, a fisherman, a farmer, a craftsmen, and other occupations. An ancient chamorro’s diet consisted of fish, taro, lemai, and other ingredients from the Earth.